A while back an engineer decided to market a vehicle that had all the spacious comfort and ruggedness of a truck, but with the seating of a small van. They decided to call this invention the Sport Utility Vehicle. When they were first introduced they were giant, hulking things with monster V8 and V6 engines. After a while, and a few price hikes at the gas pump, people started to long for the economy of their miniature four-banger compact cars. Then the cry came for the mixing of breeds. The people were speaking: Can’t we have the space of an SUV and the fuel efficiency of a compact please? The engineers answered: Absolutely! We’ll call it the crossover SUV and we’ll give it a four-cylinder engine. If this is your animal, read on and we’ll let you know what the best 4-cylinder SUVs are for the 2010-2011 model years, according to research from Car and Driver, Consumer Reports, Edmunds, and Motor Trend. You only get the option of a four-cylinder engine with the CR-V, but four different trim levels do allow for some diversity in choice. It also sets itself apart from other smaller SUVs with its quick, responsive handling and smooth, comfortable ride. Braking is quite good, which has been an issue for Honda recently, and the 35.7 cubic feet of cargo space with the seatbacks up is quite generous. Drop the backs and space improves to 73 cubes. It was awarded five stars in all front and side-impact crash tests, making it one of the safest small SUVs available. The one drawback to this efficient little crossover is road noise. Other than that, it is well-rounded and reliable. 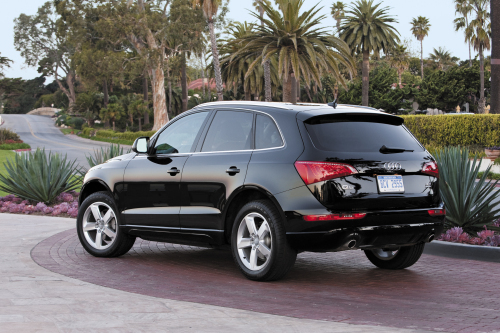 The vaulted price tag may seem excessive for such a small SUV, but luxury on the Q5 is at a premium. The 2.0L four-cylinder engine is turbocharged, allowing for a little extra kick when needed. An eight-speed automatic transmission is standard, and fuel efficiency is reasonable at 20/27 mpg (city/highway). Despite what’s under the hood, it’s the interior that will attract buyers to the Q5. It features an elegant design and top-quality materials and construction. Even with its smaller size, it manages to feel roomy no matter where you’re seated. 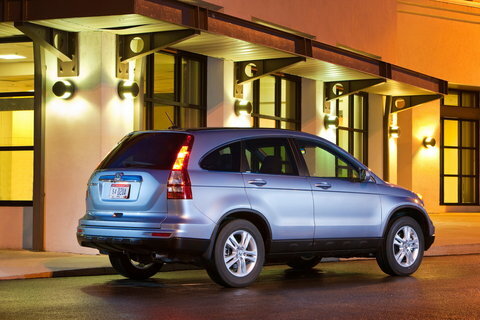 Its handling makes it one of the sportiest crossovers available, and the list of amenities is borderline limitless. Just the price alone makes the Tucson a great buy, let alone the impressive handling, handsome cabin, and well-stocked list of features. While most crossover SUVs exhibit sedan-like uninspired driving dynamics, the Tucson breaks away from the pack and offers a more sporty alternative. A sport-tuned suspension and electric power steering give it an almost coupe-like feel, but ride quality is somewhat sacrificed as a result. The 2.4L four-cylinder engine is amply powerful, but can sound like it’s straining at times. A lack of ample cargo space also brings the Tucson further down the list. Still, Hyundai’s warranty is one of the best for the price. Completely redesigned for the 2011 model year, the Kia Sportage now displays the ability to run with class leaders. The 2.4L four-cylinder engine is standard, but if you get a later model you could have the option of a turbocharged 2.0L. All-wheel drive is available, but it hampers fuel efficiency to a point that makes it unworthy of its appeal in such a small SUV. All passengers will benefit from an adequate amount of head and legroom, but cargo space comes up way short at 26.1 cubic feet with seats up. Still, it is rather fun to drive and the price is definitely right.